Action Plan (NAP) on the UN Security Council Resolutions 1325 and 1820 on Women, Peace and Security. Participants in the workshop include representatives from different government Ministries, National Planning Commission, Women’s Commission, Nepal Police, Nepal Army, Armed Police Force and civil society organizations including members of the 1325 Action Group. The three-day workshop which is facilitated by the Global Network of Women Peacebuilders (GNWP) in partnership with Nepal’s Ministry of Peace and Reconstruction, 1325 Action Group and UN Women aims to enhance the capacities of government ministries, civil society and UN entities to cost and prepare the budget for the second phase of the NAP. It also aims to promote dedicated and predictable funding for the implementation of the NAP. To guarantee the direct and meaningful participation of conflict-affected women in the formulation and implementation of relief, recovery and rehabilitation programs; and address the specific needs of women and girls. Like the first phase of the NAP, the second phase of Nepal’s NAP is undergoing broad-based consultation in different districts; and with populations directly affected by the violent conflict from 1996 to 2006. Secretary Thakur emphasized the importance of implementing the NAP at the local level. 17 percent of the government’s budget is going to be handled by local government structures, thereby ensuring the program starts at ground level, he added. He also reminded the participants to be realistic in formulating the NAP objectives and activities. A NAP without proper costing and budgeting is like a car without fuel, he said. It may have a direction but no resources to push it forward, Secretary Thakur added. Mr. Rishi Rajhandari, Joint Secretary of the MoPR, said that although all government ministries stressed the relevance of Resolution 1325 in their mandates, it is important for the ministries to allocate resources towards the implementation of the second phase of the NAP. We need to examine the challenges and the lessons learned from the first phase of the NAP and use them towards the effective implementation of the second phase,” he added. Ms. Bandana Rana, 1325 Action Group Coordinator and Chair of GNWP highlighted the objectives of the workshop. She said that though the development of the National Action Plan in 2010 was a success, the implementation was not as expected because issues related to costing and budgeting were not given much importance. She hoped that with the costing of the second NAP of Nepal the implementation would be better coordinated and adequately resourced. Ms. Mavic Cabrera-Balleza, GNWP’s CEO and International Coordinator, said, “we need strong cross-sectoral collaboration that involves government, civil society, UN and other international partners to transform the NAP from a policy on paper to an instrument that creates a positive impact on the lives of people affected by violent conflicts. It is essential that we have an idea of the financial resources required to implement the NAP and where they will come from, Ms. Cabrera-Balleza added. Ms. Sama Shrestha from UN Women said that the 2015 Global Study on Resolution 1325 and NAP mid-term monitoring report are a proof that there is a gap in the drafting and implementation of the first phase of the NAP. We can address those GAPs through proper costing and budgeting. 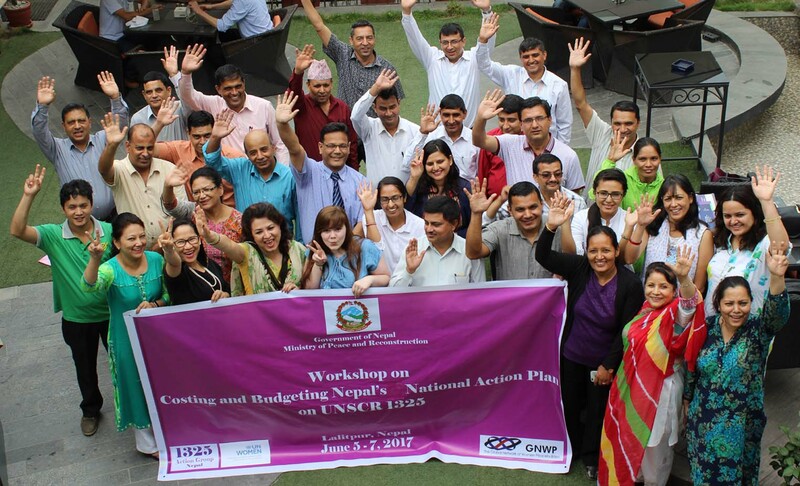 The NAP Costing and Budgeting workshop in Nepal is part of the knowledge management and capacity building strategies of the Global Acceleration Instrument on Women, Peace and Security and Humanitarian Action.